Cambodia is a travel destination where there is still much to be discovered. 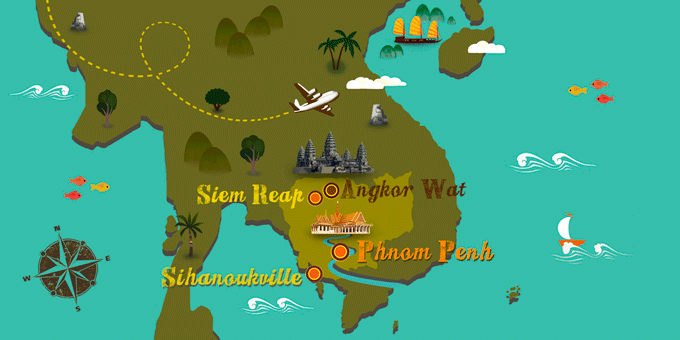 Open to tourism in fairly recent years, the country is already well known for the Angkor Wat temple complex. The main reason to make a tour in Cambodia previously was a chance to explore the place where the gods designed a visionary city. Simply witnessing a sunset against the profile of the sacred tower of Bakan, reflected in one of the Baray pools in the complex, will make your visit to the country worthwhile. While you are there, however, Phnom Penh, the capital, may just seduce you with its French colonial style neighborhoods, with beautiful Art Deco buildings at the confluence of the Mekong and Tonlé Sap rivers. Or the Royal Palace, home to the Silver Pagoda, reflecting the light of the sun in its 5,000 shimmering tiles like a luxury mirror. All this with the local character to boot, open, tolerant and good-natured, will make you very welcome in Cambodia.